At least alleged Medicaid fraudster BILL McCLURE was wanted in North Carolina. In Northeast Florida, not so much. BM got 9.8% of the vote when he ran in the Republican Primary for Congress in 2016. As a candidate for Mayor of St. Augustine, he's about as popular as the Ebola virus. What makes dodgy sexist misogynist businessmen like BM think they're qualified, or even needed or wanted, in government? 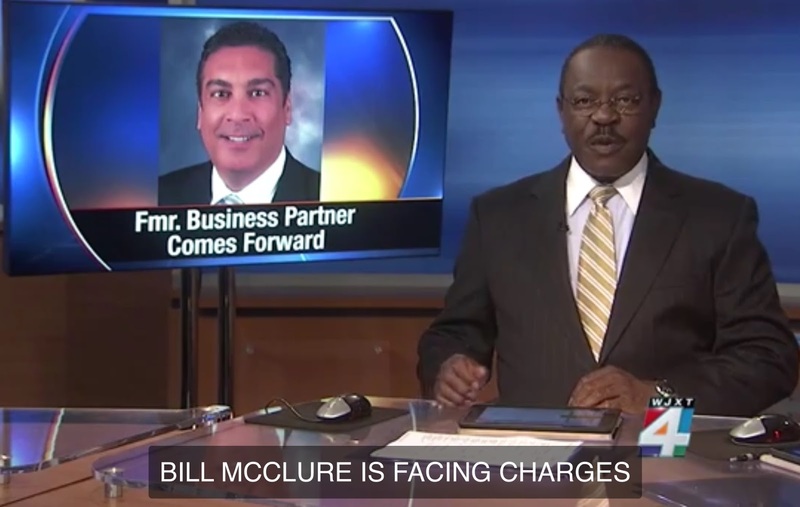 Note: Nine days after this story ran, a local judge denied McClure a stalking injunction against his former business partner, the same day McCLURE filed for it. Was McCLURE retaliating for this article? Tendentious Turkey BM can't handle criticism and has a history of retaliation and threats. McCLURE made restitution. ST. JOHNS COUNTY, Fla. - St. Johns County Commissioner Bill McClure said Monday afternoon that an arrest warrant had been issued over a mistake he made with a past business account and he was going to immediately get it fixed with a North Carolina magistrate. Officials in North Carolina said Wednesday though that the arrest warrant is still active and the woman who made the complaint is calling McClure a liar. McClure said that it was just a mistake and that he accidentally used an old account he held with former business associate Kristin Bullock to make a purchase. Bullock came out Wednesday though and said this is not the first time McClure tapped into that account. "Over the past several years a bank account that we shared has continually been tapped into by Mr. McClure without authorization. He is not in any way authorized on the account," Bullock said. Bullock said she looked the other way up until the last withdrawal of $500, that one she reported to the Matthews, North Carolina, police department. "It's always a mistake, but I don't know how many times you can make a mistake of taking money from someone's account. Kind of a big deal I would think to most people," Bullock said. When asked about this McClure said he immediately contacted the banks involved and had the transaction reversed, but Bullock said that's a flat-out lie, and she only got the money back after the issue went public in the news. "That is a complete lie. Up until yesterday no restitution was made to the account and miraculously yesterday, a deposit was made in cash at a bank branch around the corner from the Mecklenburg County D.A. 's office was made to my account," Bullock said. Since News4Jax first aired the story McClure said he was in North Carolina twice but has not responded to calls to say whether this matter was cleared up or to comment on Bullock's accusations. As far as the Mecklenburg County District Attorney's Office is concerned, the warrant for his arrest is still active and police said they have yet to make contact with him.